NOTICE: Activation key must be used on a valid Steam account. 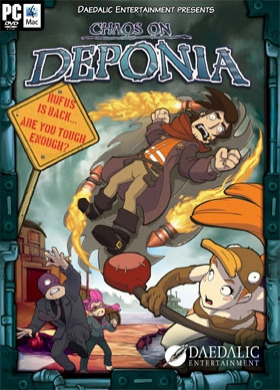 Requires internet connection.ABOUT THE GAMEWith this long-expected sequel to the critically highly acclaimed and lavishly praised Deponia, the player enters round two. Chaos on Deponia turns out to be even wackier than its predecessor and instantly puts the player under its spell. After the events on Deponia, it seems that Rufus cam… e to his senses. He's grown prudent, amicable, kind and caring, without any intention to cause major mayhem just to further his own selfish ends. It seems he is far from chaining himself to flaming saw blades, training torpedo-dolphins or foraging through platypus nests. Or is he? Ultimately it's a flaming saw blade grounding Goal on Deponia again. By accident, her consciousness gets split into three parts and stored to three different discs.Now it's on Rufus once again to convince all three parts of Goal, utilizing his remarkable charming wits, to become one again, venture to Eylsium with her and save Deponia from certain doom while he's at it. The second adventure on Deponia tells a unique, self-contained story playable without further knowledge of the first installment. Fans of the first game discover new aspects of familiar characters' backgrounds and see open questions answered.KEY FEATURES Unique world honoring the tradition of Douglas Adams, Terry Pratchett and Matt Groening. Hand-drawn art design in full HD glory and high-quality cartoon animation drawn in comic style. Bizarre characters and wacky humor meet challenging puzzles. Elaborate soundtrack with many atmospheric tracks. From the creators of the award-winning adventures 'Edna & Harvey: The Breakout' , 'Edna & Harvey: Harvey's New Eyes' and 'The Whispered World'.SYSTEM REQUIREMENTS Windows: OS:Windows XP Processor:2.5 GHz (Single Core) or 2 GHz (Dual Core) Memory:2 GB RAM , 4 GB RAM (recommended) Graphics: OpenGL 2.0 compatible with 512 MB RAM (Shared Memory is not recommended) DirectX®:9.0c Hard Drive:5 GB HD space Sound:DirectX compatibleMac : OS:Lion (10.7) Processor:2 GHz (Dual Core) Intel Memory:2 GB RAM Hard Drive:5 GB HD spaceLinux OS:Linux x86_64 Processor:2.5 GHz Single Core Processor or 2 GHz Dual Core Processor Memory:2 GB RAM Graphics:OpenGL 2.0 compatible with 256 MB RAM (Shared Memory is not recommended) Hard Drive:3 GB HDD space Sound:OpenAL compatible © 2012 Daedalic Entertainment GmbH.Chaos on Deponia, the Chaos on Deponia logo and the Daedalic logo are trademarks of Daedalic Entertainment GmbH. All rights reserved.